The underdogs may have enough in the tank to surprise us again next year. It was heartbreaking to watch the Miami Heat crowned as repeat champions of the National Basketball Association in Miami. Along with probably tens of millions of other serious basketball fanatics, I badly wanted the San Antonio Spurs to dethrone the heavily favored Heat. The Spurs did come ridiculously close to taking the title, blowing a five-point lead with twenty-eight seconds to go in game six, when they were ahead three games to two in the best-of-seven series. Even after that devastating game-six collapse, the Spurs played even with the Heat throughout the decisive game seven before succumbing only at the very end. There is no denying that the Heat are the world’s greatest basketball team. More to the point, LeBron James is, by a wide margin, the world’s greatest player. James is moving closer into that rarefied space among basketball’s all-time pantheon with transcendent legends like Michael Jordan, Bill Russell, Larry Bird and Magic Johnson. 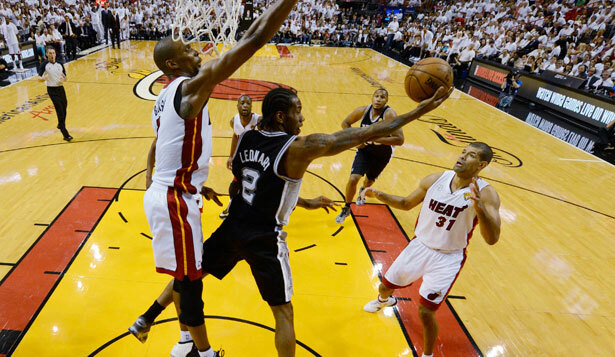 Still, the Spurs were mere seconds away from knocking off the Heat on their home floor. This despite the fact that the Spurs are located in a small-market city and their owner is not a mega-billionaire. The Spurs’ player payroll this past season amounted to $59 million, $19 million below the Heat’s. In addition, two of the Spurs stars, Tim Duncan and Manu Ginobili, are serious old-timers in basketball years, at 37 and 35 respectively. How did the Spurs get so far? Their approach to building a championship-caliber team has been the opposite of Miami’s. Three years ago, the Heat famously lured LeBron James out of Cleveland as a free agent. They also re-signed Dwayne Wade, the one star already on the team and brought in Chris Bosh from the Toronto Raptors as the third member of a newly formed Big Three. James, Wade, and Bosh each were paid more than $17 million this past season. By contrast, the Spurs coach Gregg Popovich and General Manager R.C. Buford are masters at picking out and nurturing inexpensive players, both young, unproven players as well as assorted castoffs. They have relied on intelligence, savvy and a culture of solidarity they have been cultivating for the seventeen years Popovich has been coaching the Spurs. Popovich/Buford selected Tony Parker, their all-world point guard from France as the twenty-eighth pick in the 2001 player draft. Virtually all of the twenty-seven players chosen before Parker that year have long since been forgotten. They acquired Ginobili from Argentina as the fifty-eighth pick in 1999, then waited three years for him to get out of his contract with a European team. Their emerging second-year star, 21-year-old Kawhi Leonard—who guarded James through most of the Finals and, incredibly, played him close-to-even for long stretches—was the result of a trade for George Hill, whom the team selected twenty-sixth overall in the 2008 draft. True, none of these moves would have mattered much had the Spurs not lucked into landing Tim Duncan with the first overall draft pick in 1997. Duncan has been the best combination power forward/center of his generation, and one of the two or three best of all-time. Duncan has also defined the Spurs culture by his own character and style. He comes off as highly intelligent and unassuming—the least glitzy sports star of his era. Yet Duncan combines this regular-guy personality with a fierce competiveness on the court. The Spurs could not otherwise have won four NBA championships over his sixteen-year career. Duncan also significantly upgraded his game this past season, after having slipped a bit the previous few years. Other star athletes have improved at age 37. But as far as I know, Duncan is the only one who did it without steroids. Because Popovich and Buford scour the earth for hidden talent, they have put together the most international NBA team ever assembled—nine of the team’s players, including three of its best ones, were born outside the United States. They have two French players besides Parker, and one Latin American, Tiago Splitter, besides Ginobili. Duncan himself grew up in the Virgin Islands. They even have an undrafted bench-warmer from New Zealand, Aron Baynes. We’ll see if Popovich turns him into a player. Because of Duncan’s no-nonsense proficiency and good-guy demeanor, the Spurs are sometimes considered boring. But I can’t see how anyone could think this. Parker is an acrobat driving to the basket. He won the first game of the Finals by dribbling around multiple Heat players, including James, then falling down twice while keeping his dribble, and finally hitting a fifteen-foot bank shot by ducking under James’ outstretched arms just as the twenty-four-second shot clock expired. Parker appeared to be playing Harlem Globetrotters basketball, except that it was the for-real NBA finals. Even more than Parker, Ginobili has a manic, ultra-daring playing style. The downside is that he sometimes loses control, more frequently as he gets older. He threw the ball away eight times in the Spurs game-six Finals loss, the most turnovers he’s ever had in an NBA game. Yet he was unstoppable in game five, scoring twenty-four points and delivering ten assists, as the Spurs pounded the Heat. Given the harsh realities of aging for professional athletes, this may well have been the last hurrah of the Spurs’ Duncan/Parker/Ginobili/Popovich era. It would have been sweet to see them walk off with an amazing championship upset over the mighty Heat. It didn’t happen. But this Spurs team still proved its greatness for the basketball ages. Who knows: they may well have enough in the tank to surprise us again next year. Robert Pollin is the foremost authority on NBA basketball within the University of Massachusetts–Amherst Economics Department.